PHOENIX — Following three straight losses to start the season, two of which were by over 40 points, the Phoenix Suns have experienced a season’s-worth of turmoil in just 24 hours, as the team fired its head coach and appears to be on track to lose its starting point guard. Eric Bledsoe, a veteran brought to Phoenix in 2013, tweeted, “I Don’t wanna be here” Sunday morning, indicating he may not be happy with the organization and the way it has been run this season. General manager Ryan McDonough, who said Bledsoe had voiced his desire to be traded in the preseason, called Bledsoe to ask exactly what his social media post meant, and whether it had anything to do with the team. Bledsoe was brought into McDonough’s office and sent home before shoot-around, to prepare for tonight’s game against Sacramento. The team is preparing to play without him. He was not at Talking Stick Resort Arena to comment. Suns teammate, for the moment, Devin Booker, who said he had not spoken to Bledsoe since the tweet was posted, said he could understand why he might be frustrated after multiple humiliating losses to start the year. One of the other major changes that took place Sunday night was the promotion of Jay Triano to interim head coach. 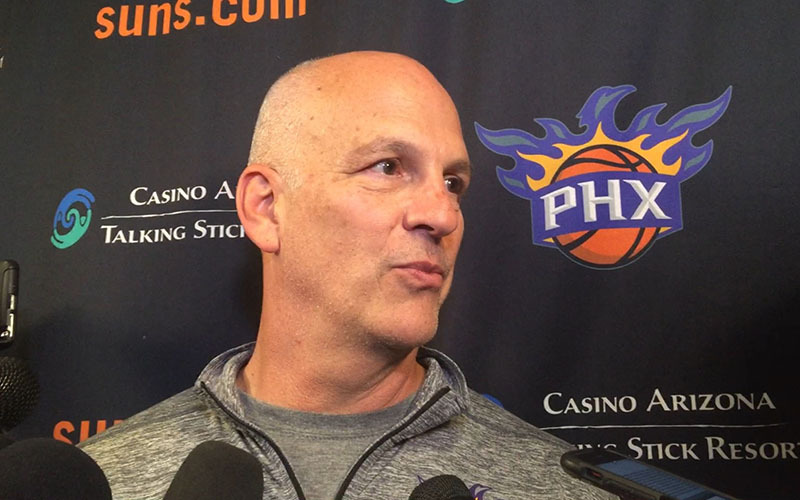 Tasked with preparing the team on short notice, without its starting point guard, Triano said the team hopes to move forward and still be a destination where people are playing hard and happy to be part of it. Bledsoe’s perceived unhappiness with the Suns is just one of the issues the Suns have faced early into the season. Frustration was shared throughout the organization after suffering the worst opening day loss in NBA history, a 124-76 loss to the Portland Trail Blazers followed up by a 130-88 loss on the road against the Los Angeles Lakers just nine days later. However, McDonough said the decision was not merely a reaction to three games. Though preaching patience and rebuilding the team with young talent, McDonough said Earl Watson and many of the assistants under him were insufficiently preparing the young players for successful careers in the NBA, while also not winning games in the present. “We expect to be competitive, and for the guys to play hard and be put in positions to be effective offensively and defensively, and we didn’t feel like that was getting done,” he said. However, Booker said he believed that the change may have been made too soon. Watson, Booker said, had a positive impact on all the players, not just in basketball, but as men as well. He called the change “eye-opening,” and said that, though Watson was in charge of aspects such as player rotations or scheme, two 40-plus-point losses could not be blamed on the coaching staff. “That comes with pride, comes with effort, a love for the game, and we haven’t shown that yet,” he said. Moving forward, McDonough said, Triano should be able to coach the remaining 79 regular season games under the interim role, and the team hopes to see an improved offense, including ball movement player movement, spacing and three-point shooting. The front office also expects Triano to delegate much of the responsibility to hisassistants, including Tyrone Corbin, who will move to the lead assistant role, especially on defense. Tyrone Ellis of the Northern Arizona Suns, as well as Marlon Garnett, will be promoted to assistant coaching positions. Asked what went wrong, Triano said it was simply a lack of effort and aggressiveness out of the gate. Triano spent 2008-2011 as the head coach of the Toronto Raptors, four years as an assistant with the Portland Trail Blazers and is currently the head coach of the Canadian National Basketball team. He said he has plenty of experience developing young players into some of the most productive in the NBA, such as C.J. McCollum, Damian Lillard, DeMar DeRozan and Andrew Wiggins, and hopes he will be able to translate that ability over to Phoenix’s young roster. “Some of our guys are one year, two years removed from playing college basketball. So, I think they’re younger, but the talent level is extremely high and our job is to teach them the game,” he said. Though he noted that he may try to move toward a more-traditional roster set-up, with a big player at the power forward spot, keeping the team’s smaller units as weapons for later in the game, he does not want to completely move away from some of the lessons Watson had provided for his players and staff. Triano said Watson had multiple quality messages of unity and brotherhood, and that he learned a lot from his former boss, and a player he coached for one year in Portland, that he had never seen from others in the NBA. “His ability to just tell a player what he actually thought and getting the truth to them, I think that was one of the things you learn from him and I want to take moving forward,” he said.